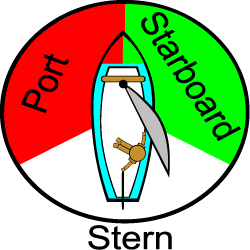 How did the terms "port" and "starboard" come about? Boats developed from simple dugout canoes. When the paddler steering a canoe is right handed (and the majority of people are right-handed), he or she naturally steers over the right-hand side (looking forward) of the boat. As canoes developed into larger vessels, the steering paddle grew larger and developed into a broad-bladed oar, held vertically in the water and permanently fixed to the side of the boat by a flexible lashing or a built-in moveable swivel. The seagoing ships of maritime Northern Europe all featured this side-hung rudder, always on the right hand side of the ship. This rudder (in Anglo-Saxon the steorbord) was further developed in medieval times into the more familiar apparatus fixed to the sternpost, but starboard remains in the language to describe anything to the right of a ship’s centreline when viewed from aft. If starboard is the right-hand side of the vessel, looking forward from aft, the left-hand side is port – at least, it is now! In Old English, the term was bæcbord (in modern German Backbord and French bâbord), perhaps because the helmsman at the steorbord had his back to the ship’s left-hand side. This did not survive into Medieval and later English, when larboard was used. Possibly this term is derived from laddebord, meaning ‘loading side’; the side rudder (steorbord) would be vulnerable to damage if it went alongside a quay, so early ships would have been loaded (‘laded’) with the side against the quay. In time laddebord became larboard as steorbord became starboard. From an early date, port was sometimes used as the opposite for starboard when giving steering orders, perhaps deriving from the loading port which was in the larboard side. However, it was only from the mid-19th century that, according to Admiral Smyth’s The Sailor’s Word Book, published in 1867, ‘the left side of the ship is called port, by Admiralty Order, in preference to larboard, as less mistakeable in sound for starboard’.